WordPress is among the famous website builder and it is used by most of us. If you are new to WordPress then you will be wondering what is the difference between WordPress.com and WordPress.org. Actually both are two independent platforms. If you want to start building your website then you should know the difference between both these. In the below Infographic we have included the key difference between both the platforms. .com - No plugins allowed | You are not allowed to upload plugins and need to use the default plugins only in the free plan. .org - All plugins allowed You can upload and use any plugins - paid/free as per your requirements. .org - You can built an eCommerce website and customize it according to your needs. .com - Limited storage and you get 3 GB space with the default free plan and you can upgrade to premium plan if you need additional space at any point of time. .org -Unlimited storage. Depends on your hosting company and your plan. .com - In the free hosting you are not allowed to sell ad services but you can pay and remove the ads which will be there in your website. .org - No external ads will be promoted unless you use any ad service. You are free to use the ad service and there are no restrictions as it is a self hosted website. I hope this article have solved your doubts regarding the difference between WordPress.com and WordPress.org I completely agree that both the platforms are having a single origin but both serve different objective. 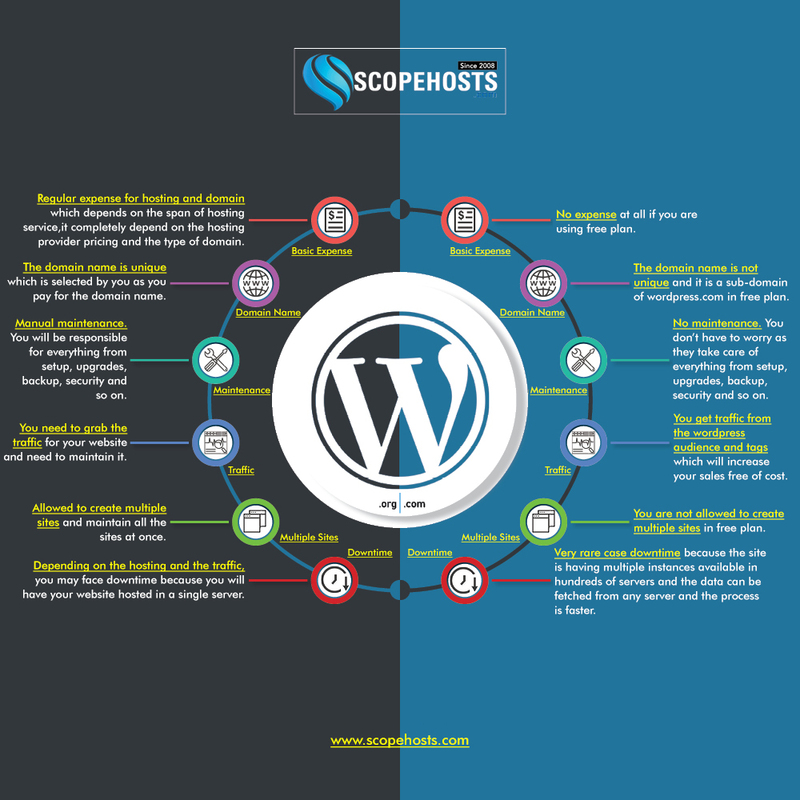 The main and very important Difference between WordPress.com and WordPress.org is where your site is hosted. As you already know the difference between both, you can decide which platform you would like to choose.